The SAICI entered negative territory for the first time in almost two years. The SMICI rebounded from October drop, but is still well below the 20 recorded in August. Among all investors, Stock and Stock Mutual Fund investing dropped, and those Not Investing increased for both indices. 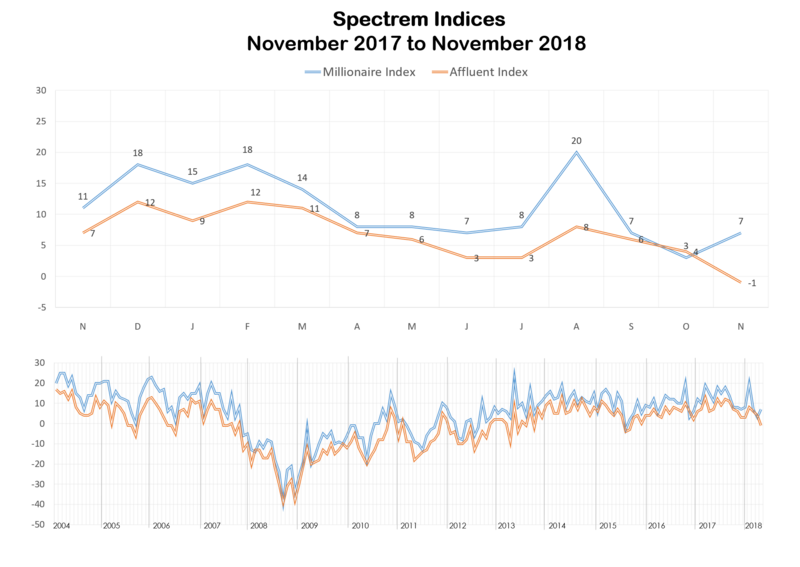 The Spectrem Confidence Indices balance interest in equity investments and safety investments, and that balance came into play in the November Spectrem Millionaire Investor Confidence Index (SMICI). Although Millionaires backed off Stock and Stock Mutual Fund investing in November, they also showed a reduced interest in Individual Bond, Bond Mutual Fund and Cash investing, which explains a portion of the rise in the SMICI to 7, the mark it reached in September. At the same time, Millionaires reported a higher Household Outlook in November, which also causes the overall index to rise. Meanwhile, the SAICI, which includes both Millionaires and Non-Millionaires, dropped to -1, the first time below the zero mark since sitting at -3 in February of 2016. Because the Non-Millionaires reported a lower Outlook for most components, the overall SAICI dropped in comparison to the rise in the SMICI. The monthly SAICI tracks changes in investment sentiment among the 17 million households in America with more than $500,000 of investable assets. The SMICI reflects the investment sentiment of households with more than $1 million in investable assets. The November investor fielding took place between November 26-27, 2018. In November, the nation watched as the House of Representatives turned to a Democratic majority, although that majority does not go into power until January. At the same time, the Senate gained Republican seats, which could be a buoy for conservatives and business leaders who support Republican economic points of view. Balancing that optimism was the three-day run during Thanksgiving week when the Dow Jones Industrial Average lost more than 1,000 points. By the end of the month, when the investor survey was conducted, the Dow had recovered much of those losses. Stock and Stock Mutual Fund investing fell among all investors, and the biggest drop was Stock Mutual Fund investing for non-Millionaires, which was halved from 34.4 percent to 17.2 percent. Among Millionaires, there were 4-8 percent drops in the safer products like Individual Bond and Cash investing, and non-Millionaires followed suit. Those Not Investing, the percentage of investors who state their intention to either maintain their current level of investing or decrease it, rose among Millionaires to 36.6 percent, the highest level of the year, and rose to 55.2 percent among Non-Millionaires, the first time over 50 percent since July of 2017 and the highest level of non-participation since December of 2013. The Spectrem Household Outlook, a measure of the long-term confidence among investors in four financial factors which impact a household’s daily life, dropped overall to 13.80, a two-month decrease from the mark of 30.2 in September. But that was driven by a drop in Outlook among Non-Millionaires (from 21.52 to 8.84) while Millionaires reported an increase In Outlook from 13.67 to 18.10. However, Millionaire Outlook stood at well over 30 for half the year. Overall, the four components of the Outlook fell, although none fell dramatically. Among Millionaires, the Outlook for Household Assets reached 41.79, a 6-point rebound. The most reactive component in the Outlook is the Economy, and the Outlook in November fell among non-Millionaires to -12.93 after four months in positive territory. Among Millionaires, the Outlook for the Economy pulled out of negative territory barely to 2.24.